One night as you are preparing for bed, you feel a light rumbly tension in your lower back. Things look a little brighter. Noises are more crisp and they ring in your ears a bit more. You rub your back, wrap it in a warm heat pad and lay down to sleep. 12 minutes later, the light rumbly tension comes again, this time a little more intensely, a little more solidly. You wonder...could this be it? Has labour begun? Do I call the birth photographer? No no...not yet...she said when things start to pick up - active labour. Ok.
You rest in and out of sleep and low back rumblings for the next few hours until it gets to the point where you need to vocalize to ease them. You are excited - this might be it! They are getting closer together, you can feel the tension down your thighs now - around your belly...you need to stand up and walk. They come more closely. You wake your partner. "Call the midwife please, it's time." "Call the birth photographer, it's time." So begins the story of the day your baby is born. I will come to your birth when active labour begins - usually at the same time that you call your midwife - sometimes an hour sooner. My job is to document your birth story as it happens. We will have agreed on a few things beforehand - I will know which images are really important to you, I will know which images you will treasure most. My job is to catch those as I can. I will stay up to two hours after baby arrives to capture all the little details too like fingers and toes and baby's first exam. From there, I will go home, upload your images to my computer, back them up and send you a sneak peek or two. I will then deliver your image gallery 6-8 weeks later. You wait 6-8 weeks to give me my birth images? Why? I believe that honouring your birth space includes the space and time after baby is born. Those first 6 weeks are important - it is your time with your baby, your family...so many important chapters of your relationship are being built. You might tell your friends and family members the story of your birth as you experienced it. I want to honour that time, your birth story is yours. This is a decision that has evolved - I used to aim for 2-3 weeks post birth - but after the 6-7th birth I realized it didn't feel quite right. There was something in my gut that whispered that seeing birth images so close to a birth might be too much. Too soon. I reflected back on all the books and articles I've read about women and birth and birth stories. I revisited some of the books I had on hand in my personal library. I read some blog posts. I listened to the women's words after they saw their images. Some were happy - ready to see them. Others - it wasn't time yet. They were still getting to know their new baby. Still adjusting to the huge hormone changes. Still trying to figure out feeding baby. It was too soon. From those earlier "birth photog" experiences of hearing women's reactions to their images, I changed the timing. I wanted women to have time to tell their birth story as they experienced it - I remembered reading somewhere that a woman needed to tell her story 7 times to full integrate? Was that right? Where had I read that? I tapped into my doula friends and midwife friends and asked them what they thought. And that is when I started giving women their images 6-8 weeks after birth. I recently asked Jennifer Gillean from Birth Story Healing for her input. Jenn is well versed in birth story healing and works with Mothers, Families, Doulas and Midwives in Ottawa and Gatineau and beyond. She and I have spent time at her beautiful retreat centre in Chelsea and we've chatted a lot about women and birth stories and healing and integration. I wanted to capture a quote from her thoughts...but what she wrote was so well put I've decided to share it all here instead. 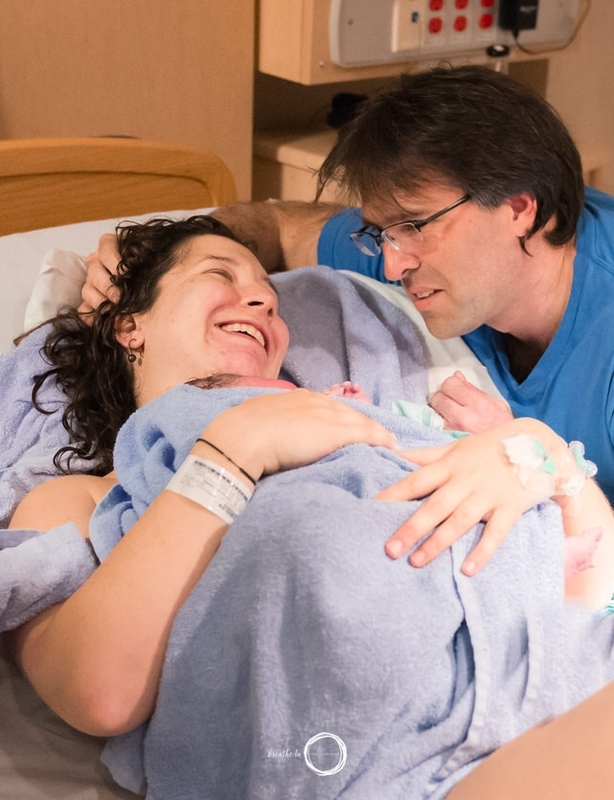 Based on your work with birth stories and your training through Birthing from Within what do you think about the timing of birth image sharing? When Kim told me that she waits 6-8 weeks before sharing the photos with the parents, I think I yelled out: “Yesssss!” It really shows that she understands the sacredness of this time for the mother and family to connect and begin to integrate the birthing experience. Soon after the birth of her child, a woman begins to process her experience. Birthing From Within’s Pam England characterizes the journey of integrating the birth as one that involves passing through gates. In the beginning, it is important to simply listen to a mother’s story as she tells it, without interjecting our own perspectives, impressions or comments. Although her child has just been born her story is now beginning its own birth, so it can be helpful to give the mother space to cultivate her story’s evolution on its own, without anyone else’s imprints. Once the birth has clearly ended, each mother crosses the threshold at the Relief and Gratitude Gate-the birthing experience is done. Whatever the experience, extremely satisfying or incredibly challenging, the mother almost always exudes deep relief and gratitude that her baby is now born. From there a woman’s social story, the one that she outwardly shares, begins to emerge and she looks more closely at the relationships to others and to herself that surface from the birth. Photographs capture moments in a birth, perhaps moments that the woman herself didn’t quite see or perhaps remembered differently. Photographs can carry such weight in shaping a woman’s story, how she remembers or tells it, that I am so thankful Kim gives the families some time to settle into the parent's own version of the story. I feel like once a mother sees the photographs, because she has had some time to integrate her story, the experience of seeing her birth from a different perspective has the potential to add another transformative layer to the birthing experience, because now she is ready to shift her lens of attention and notice things she may not have been able to see before. What if I really want to see my birth images sooner than 6-8 weeks? Well, of course that is something we can talk about - 6-8 weeks is also a manageable time for me to edit and process your images. When things get busy and babies arrive in groups (this happens a lot! ), sometimes that is the time I need to process your images and run my business smoothly. I am open to offering images sooner if a family asks, however since setting this timeline families have been happy with the timing. I hope this timeline honours the time a family needs to integrate their birth story as they experienced it. I hope that seeing their images weeks later will bring them joy as they remember the day their baby was born. When did you see your birth image gallery? What do you think about the timing?